fmriprep adapts its pipeline depending on what data and metadata is available is used as the input. For example, slice timing correction will be performed only if the SliceTiming metadata field is found for the input dataset. This sub-workflow finds the skull stripping mask and the white matter/gray matter/cerebrospinal fluid segments and finds a non-linear warp to the MNI space. fmriprep uses FreeSurfer to reconstruct surfaces from T1w/T2w structural images. If enabled, several steps in the fmriprep pipeline are added or replaced. All surface preprocessing may be disabled with the --no-freesurfer flag. 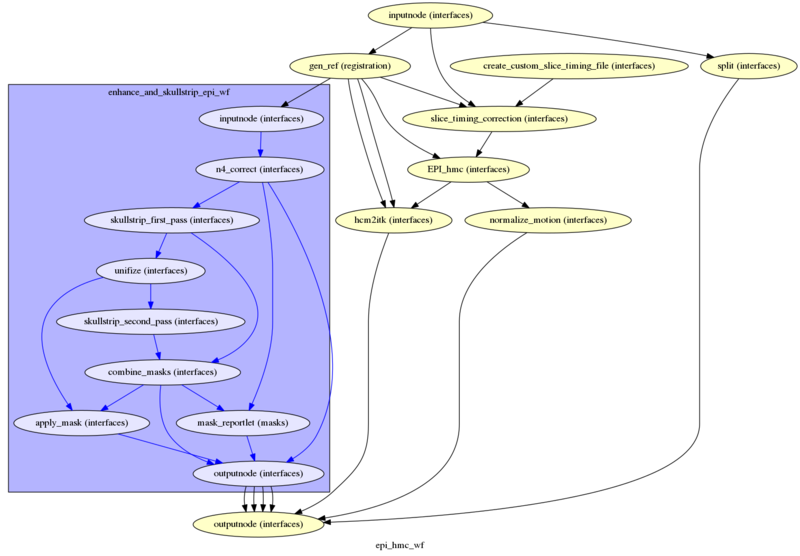 Preprocessing of BOLD files is split into multiple sub-workflows decribed below. This workflow performs slice time correction (if SliceTiming field is present in the input dataset metadata), head motion estimation, and skullstripping. Slice time correction is performed using AFNI 3dTShift. All slices are realigned in time to the middle of each TR. Slice time correction can be disabled with --ignore slicetiming command line argument. FSL MCFLIRT is used to estimate motion transformations using an automatically estimated reference scan. If T1-saturation effects (“dummy scans” or non-steady state volumes) are detected they are used as reference due to their superior tissue contrast. Otherwise a median of motion corrected subset of volumes is used. Skullstripping of the reference image is performed using Nilearn. Applying field correction warp using ANTs. Phase-difference techniques: to estimate the fieldmap, these methods measure the phase evolution in time between two close GRE acquisitions. Corresponds to the sections 8.9.1 and 8.9.2 of the BIDS specification. 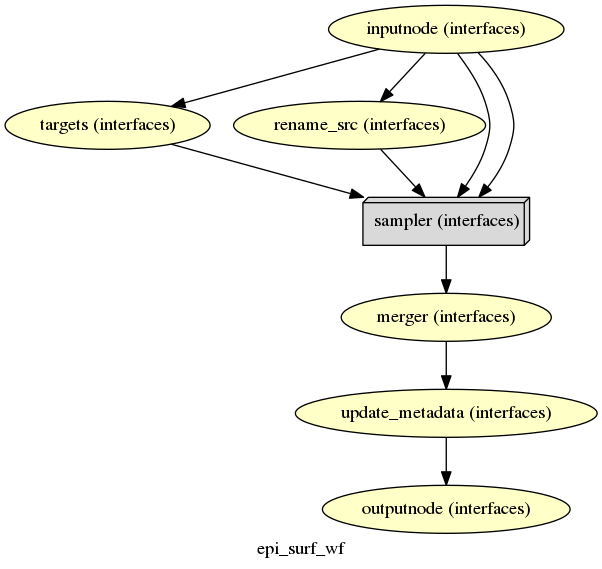 Direct field-mapping: some sequences (such as SE) are able to measure the fieldmap directly. Corresponds to section 8.9.3 of BIDS. Blip-up/blip-down or phase encoding polarity: pepolar: techniques acquire at least two images distorted due to the inhomogeneity of the field, but varying in PE direction. Corresponds to 8.9.4 of BIDS. Point-spread function acquisition: Not supported by FMRIPREP. Identifying field-mapping resources: the input BIDS dataset is queried to find the available field-mapping techniques and the appropriate processing workflows are set-up (applies to phase-difference and direct field-mapping techniques). Fieldmap estimation: all the estimation workflows produce a displacement field ready to be used in the correction step (applies to phase-difference and direct field-mapping techniques). Unwarping EPIs: the correction step is applied (for phase encoding polarity this step also involves distortion correction displacement field estimation). Additionally, FMRIPREP now experimentally supports displacement field estimation in the absence of fieldmaps. 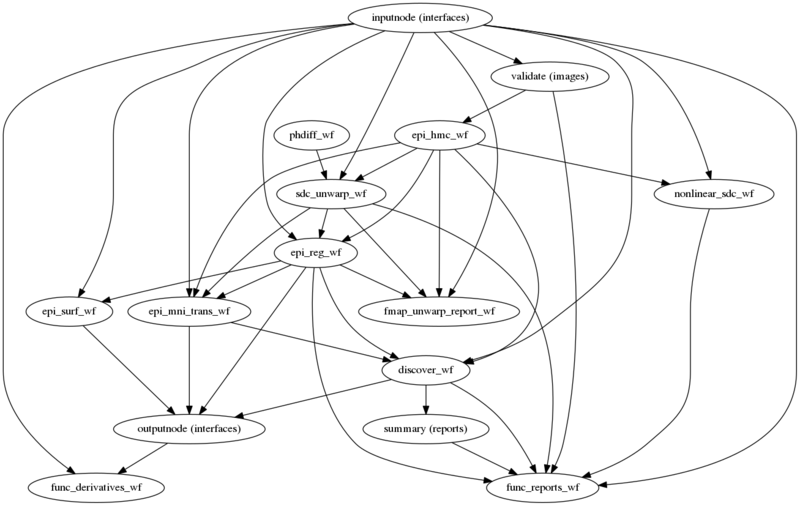 See Fieldmap-less estimation (experimental) for further details. The reference EPI image of each run is aligned by the bbregister routine to the reconstructed subject using the gray/white matter boundary (FreeSurfer’s ?h.white surfaces). 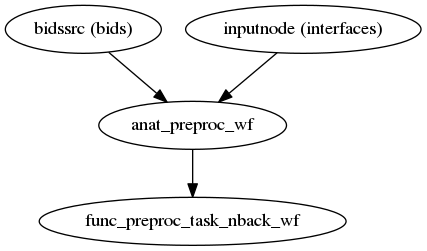 If FreeSurfer processing is disabled, FLIRT is performed with the BBR cost function, using the FAST segmentation to establish the gray/white matter boundary. This sub-workflow uses the transform from Head-motion estimation and slice time correction, Susceptibility Distortion Correction (SDC) (if fieldmaps are available), EPI to T1w registration, and a T1w-to-MNI transform from T1w/T2w preprocessing to map the EPI image to standardized MNI space. It also maps the T1w-based mask to MNI space. Calculated confounds include the mean global signal, mean tissue class signal, tCompCor, aCompCor, Framewise Displacement, 6 motion parameters, DVARS, and, if the --use-aroma flag is enabled, the noise components identified by ICA-AROMA (those to be removed by the “aggressive” denoising strategy). 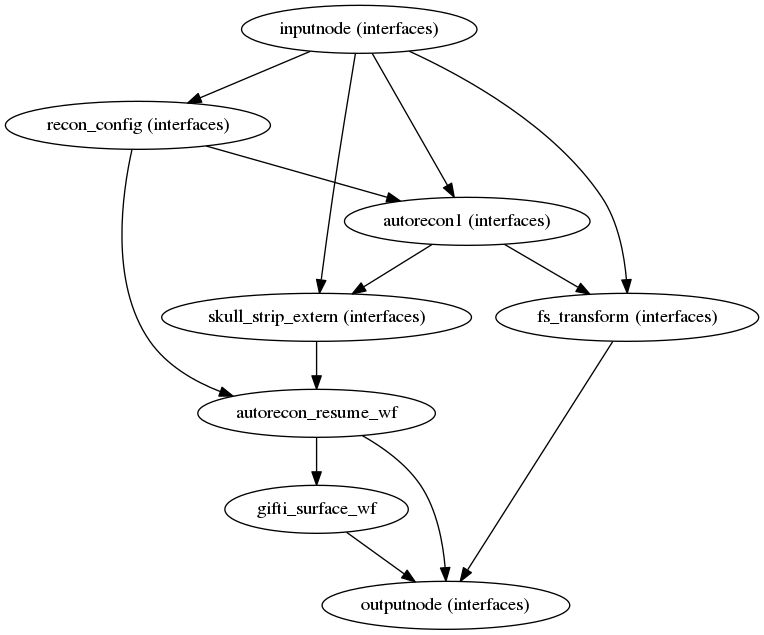 FMRIPREP outputs summary reports, outputted to <output dir>/fmriprep/sub-<subject_label>.html. These reports provide a quick way to make visual inspection of the results easy. Each report is self contained and thus can be easily shared with collaborators (for example via email). View a sample report. 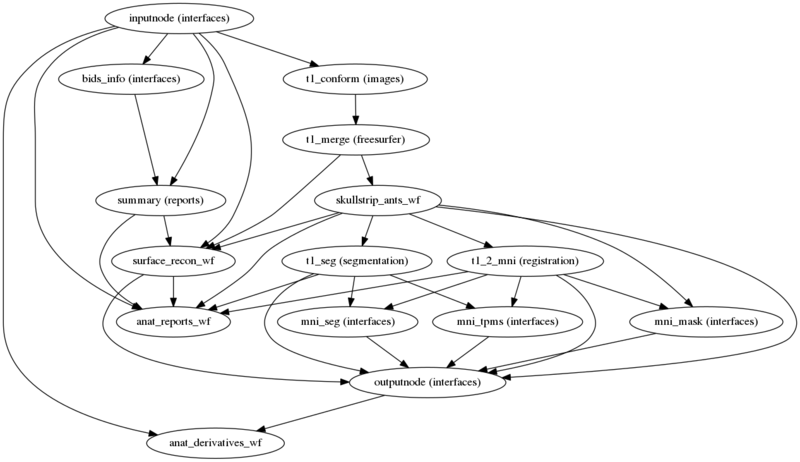 There are additional files, called “Derivatives”, outputted to <output dir>/fmriprep/sub-<subject_label>/. See the BIDS Derivatives spec for more information. *T1w_space-MNI152NLin2009cAsym_brainmask.nii.gz Same as above, but in MNI space. 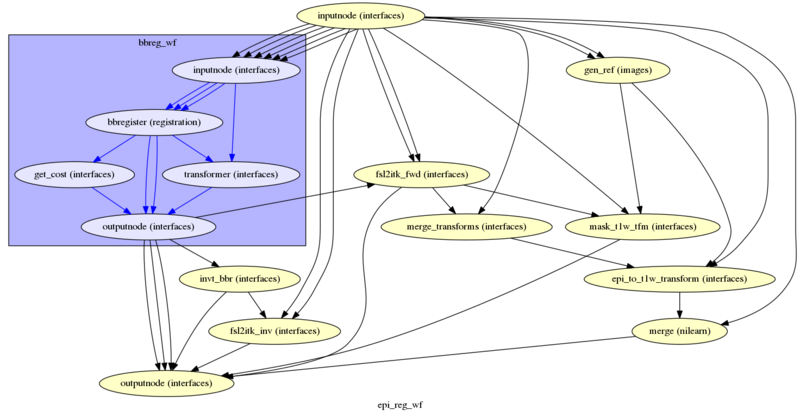 *T1w_dtissue.nii.gz Tissue class map derived using FAST. Derivatives related to EPI files are in the func subfolder. Volumetric output spaces include T1w and MNI152NLin2009cAsym (default). Surface output spaces include fsnative (full density subject-specific mesh), fsaverage and the down-sampled meshes fsaverage6 (41k vertices) and fsaverage5 (10k vertices, default). A FreeSurfer subjects directory is created in <output dir>/freesurfer. Copies of the fsaverage subjects distributed with the running version of FreeSurfer are copied into this subjects directory, if any functional data are sampled to those subject spaces.